SWBAT explain what parts of the Missouri Compromise benefited the North and what parts benefited the south. Directions: Read the following paragraphs and answer the guiding questions. Be prepared to discuss. As the country expanded westward, sectional tensions increased. The north and the south grew increasingly apart socially, economically, and politically. In the year 1819, there were 11 states that allowed slavery and 11 states that did not allow slavery. This meant that in Congress there was an equal balance of power in the Senate between the slave and the free states. That same year, the territory of Missouri petitioned to become a new state. Missouri currently had slaves. This created even more tension in the country because people wanted to keep the balance of Power equal. If a new slave state was added to the Union, then that meant that there would be two new Senators in the Senate that would be pro slavery. People in the North, who wanted to abolish slavery saw this as a danger. It would be hard to pass laws outlawing or slowing down slavery. The north and the south had to come up with some sort of agreement over what to do with the Missouri territory. 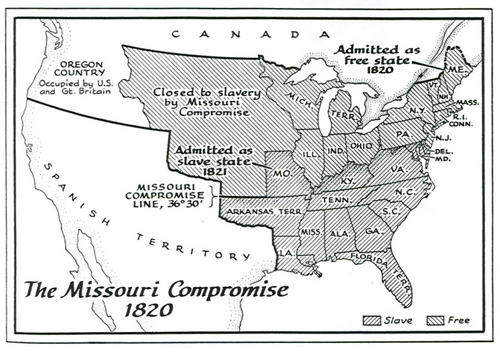 The compromise that they made in 1820 was called the Missouri Compromise. What were the three ways that the North and South were growing apart? What territory caused controversy in 1819 when they petitioned for statehood? How many slave states and how many free states were there in 1819? Based upon the context, what do you think abolish means? True or False? Missouri was a free state? What was the name of the compromise made over Missouri? With the War of 1812 won, Americans could concentrate on solving what was a growing internal problem: what to do about slavery. The first ships containing African slaves had arrived on American shores in 1619, and the slave trade had picked up in the 18th Century. The expansion of cotton and other types of farming in the South required more and more labor, and more and more plantation owners turned to slaves to fill their workloads. By the turn of the 19th Century, more and more people began to see slavery as something wrong, most of these people lived in the Northern states. As more and more territories were applying to become states, the decision of whether those states could allow slavery was becoming a very important issue. One by one, states joined the Union. From 1816 to 1819, two Northern and two Southern states joined the Union. The two Northern states, Illinois and Indiana, did not allow slavery; the two Southern states, Alabama and Mississippi, did. The slavery issue was rapidly driving the country into two separate camps, and Congress wasn’t doing anything to stop the growing tension between the two. Both sides made threats over continued settlement of the Louisiana Territory, and neither side was willing to give the other even a temporary advantage. When Missouri applied to become a state, in 1819, the Union had 22 states, 11 allowing slavery and 11 outlawing it. Missouri wanted to become a slave state. Anti-slavery leaders were afraid that allowing another slave state would upset what was then a delicate balance between slave states and free states. Slavery had been an issue ever since the adoption of the Constitution, which agreed to count African-American slaves as three-fifths of a person for population purposes, sending the message that they were inferior to European-Americans. And even though George Washington freed his slaves (Yes, he did have them at one time! ), not too many other Southerners followed suit. The plantations that dotted the South depended heavily on slave labor for their livelihood, and slave owners weren’t about to give up a practice that saved them a lot of money. Slavery really had two fronts, then. One was economic: Slave owners counted slaves as saved revenue, meaning that they would have had to pay for that labor otherwise. The other front was moral: Many people believed that it was wrong and against the principles of the Declaration of Independence and the Constitution that one person could own another. Abolitionists wanted slavery outlawed everywhere, and they were willing to resort to violence to get what they wanted. Many slave owners and even non-slave-owning Southerners were willing to fight to keep what they thought was their right to own slaves if they chose. The country, only five years removed from a victory (again) over Great Britain, was close to going to war with itself. So how did Congress solve this growing problem? By compromising. Because both sides were on opposite sides of the issue, both sides couldn’t be satisfied by the same outcome. So Congress gave both sides something: Each side got a new state. Maine applied for statehood about the same time, and both were eventually admitted to the Union, Maine as a free state and Missouri as a slave state. The Missouri Compromise, as it was called, found its greatest champion in Henry Clay, who was at that time the Speaker of the House. A War Hawk from his days advocating war with Great Britain, he tried desperately to keep the North and South from fighting over the slavery issue. 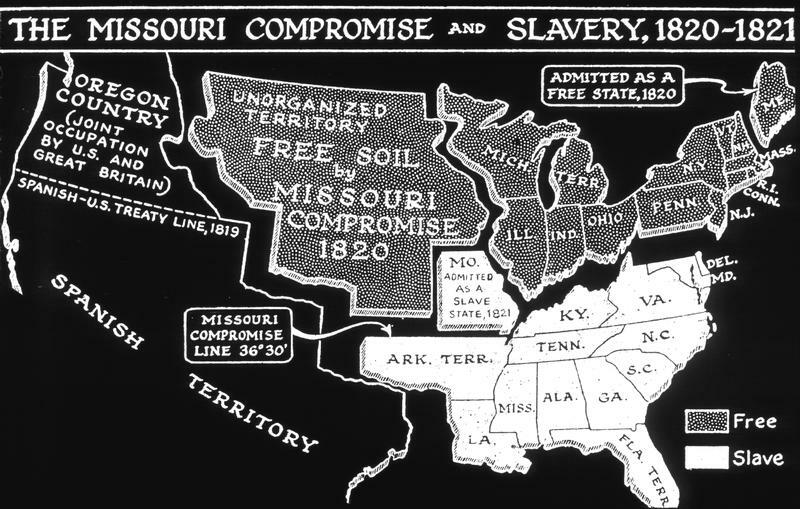 Largely because of Clay’s efforts, the Missouri Compromise went into effect. Slavery was forbidden north of the 36 degree latitude mark, the southern boundary of Missouri. The Missouri Compromise solved the immediate problem but didn’t solve the slavery issue as a whole. As many people on both sides were sure, that would take a war. What was the growing problem in America? When did the first slaves arrive on American shores? Why was more and more labor required in the south? Name four states that entered the union in the 1800s and explain whether they are slave or free. What compromise occurred during the creation of the Constitution? What were the “two fronts” of slavery? What were the two states admitted to the Union because of the Missouri compromise? Who was the person who was responsible for the Missouri compromise? What were three of the provisions of the Missouri Compromise? Why do you think the Missouri compromise won’t last and that America will eventually have a war?